Right-handed pitcher Matt Shannon impressed in his brief stint with the Vancouver Canadians last season. Pitching in four innings last summer for the Canadians; Shannon allowed just one hit, while striking out four. His ability to get hitters out comes from Shannon’s four pitch mix. Currently using a 4-seam fastball, sinker, changeup, and slider in his repertoire, and the righty is ready for a bigger role next season. Shannon is unsure what that role will be at the moment, but he is open to any possibility. Prior to playing professionally, Shannon spent three seasons at Angelo State University. Finishing his collegiate career with a 1.19 WHIP, and a 8.68 K/9 ratio in 253 innings pitched. 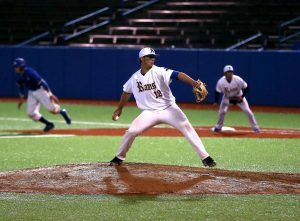 Shannon credits his time as a member of the Rams’ baseball team to his excellent start in pro ball. Enjoying a greater focus on the game now, Shannon discusses the biggest transition he’s noticed between college and professional baseball. Currently recovering from a foot injury suffered in July, Shannon hopes to pick up where he left off in 2017. Toronto Blue Jays fans hope Matt Shannon can do just that, too.